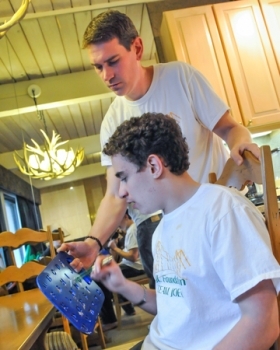 While on a trip to Aspen to help promote the International autism event “Light it Up Blue” and the local event “Vertical Blue,” Joey Lowenstein got the attention of quite a few people, including the local media. Dorothy Atkins of Aspen Daily News covered the story about how Joey, through the JL Foundation is helping other kids with autism, learn more and get more out of life. For most of his life, 16-year-old Joey Lowenstein barely had a voice, with autism limiting his speech to a few words and phrases. In the last year, Lowenstein’s world has changed, thanks to a tool allowing him to point to letters on a board and spell out his thoughts and opinions into sentences. Using this device, Lowenstein told his mother Roberta he wanted to help other people with autism enrich their lives. The comment inspired the family to create a foundation — the Joey Lowenstein Foundation — that has been raising money to benefit programs for those diagnosed with autism, like Carbondale-based Extreme Sports Camp (ESC) and Challenge Aspen. Earlier this week, Lowenstein and his family made up a team that participated in the Vertical Blue challenge held by ESC on all four mountains. About two years ago, Roberta Lowenstein heard of a method of communicating where people with autism point to letters on a plastic board and spell out sentences in a process called the Rapid Prompting Method (RPM). She decided to try the method with her son, and with the help of local teacher Matthew Kennedy, Joey Lowenstein can now respond to questions and express his opinions. The letter board changed the way Roberta Lowenstein understands her son, she said. She never really realized . . .